There's a lot of stuff about living in New York that television gets completely wrong. From two broke buddies living in a gorgeous, sprawling West Village apartment to depicting Times Square as anything but a horrifying hellscape, television makes a lot of mistakes when it comes to showing the realities of living in NYC. But one of the most egregious and terrible mistakes that is frequently made is the inaccurate representation of New York geography. TV shows with no sense of New York City geography have been misleading many tourists for years. They get off the subway on the Lower East Side and are suddenly scratching their heads, thinking, "Wait, so this isn't Central Park?" Locations of various historic sites in New York have been falsely portrayed multiple times. Maybe television directors been led to believe that all it takes to get to Manhattan from Nassau Avenue is a quick ten-minute train ride. TV shows set in New York have perpetuated the notion that you can get anywhere in a tight five minutes by whistling at a cab. Well, it's time to call out the most inaccurate assessments of geography in New York City in a handful of different TV shows. Gossip Girl loves sending its characters to rooftops for fancy parties. And, for the most part, it loves keeping its characters confined to the Upper East Side. Where else is Manhattan's elite supposed to live their scandalous lives? But sometimes, the rooftop view don't quite match up with their supposed location. For instance, take the second episode of Season 3, "The Freshman." Blair and Dan attend an NYU rooftop party, but the spectacular view they're surrounded by does not match with NYU or its dorms. It looks as if the party is in Midtown, ensconced by skyscrapers. In reality, none of the NYU dorms are located above the early 20s streets. In fact, a few of them are smack dab in the middle of Manhattan. Even if they were capable of seeing some of the skyscrapers, it would be a very one-sided view. You'd most definitely have a river on the other side of the rooftop. But in "The Freshman," Gossip Girl characters are surrounded by some of New York's most iconic architecture. Lies. Girls creator Lena Dunham admitted to making a New York geographical faux-pas early during the show's tenure. The location error occurs in Season 1, Episode 3, "All Adventurous Women Do." Marni meets the artist, Booth Johnathan, at a work function. The art gallery that Marni works at is supposedly located near the High Line, which starts in the Meatpacking District and ends at West 34th Street. In reality, the art gallery Dunham and company shot the scene in is located on Delancey Street, which is in the Lower East Side. Marni and Booth run out of the art gallery and up to the High Line, despite the fact that it should be on the opposite side of Manhattan. RIP Mysteries of Laura. You were a weird '90s throwback of a show that posed the age old question, "Can women have it all?" Apparently not! Mysteries of Laura got cancelled after two seasons. Viewers will never know if Laura could handle both her kids and her law enforcement career simultaenously. Though perhaps it was for the best, because Laura did not know her New York geography well enough to be a reliable cop on the New York beat. While investigating a murder, one character breaks it down for Laura and her partner, telling them, "Where you're standing, the intersection of 43rd and 4th is out of range of every single video camera in the vicinity." First, 43rd and 4th doesn't exist. That's not a real intersection because 4th avenue is only six blocks long and turns into Park Avenue (4th was renamed Park Avenue in the 1800s). Bosom Buddies, like Friends and Seinfeld, was one of many sitcoms set in New York, but filmed in Los Angeles. However, Bosom Buddies may take the cake for exercising the most blatant disregard for New York geographical accuracy, as seen in the show's opening credits. Bosom Buddies stars a young Tom Hanks and Peter Scolari as two New York ad men who disguise themselves as women in order to stay at the women-only Susan B Anthony Hotel. Presumably, they get into all kinds of dragged up scraps. In the show, Hanks and Scolari are shown running through a park filled with those iconic New York City palm trees. You know the ones! They pepper the skyline and the streets of the city. Oh, sorry – that's Los Angeles! 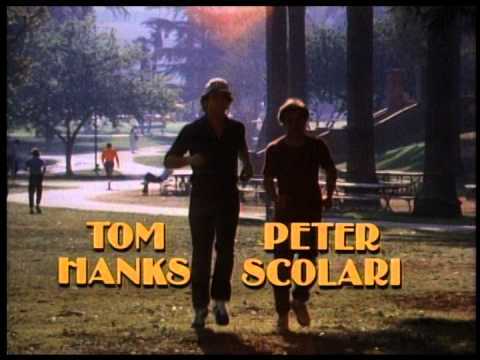 Bosom Buddies didn't both to find a park that was devoid of any LA iconography and just let Hanks and Scolari roll around in close proximity to palm trees. They did sneak a hot dog vendor in there though, for that NYC authenticity.